Most companies are moving from desktop to mobile, but Shazam is going in the other direction, announcing today that its popular music and TV recognition app is now available to download on Mac as a desktop application. When on, Shazam will silently listen in the background for music played from both the Mac itself and other device around you, giving you a gentle notification when it finds a matching song or TV show. Shazam on desktop might not immediately sound like an obvious fit, but when we consider how many times we grab our phones to scan a bit of a YouTube video or TV show we stumble across, the benefits start to surface. You can choose to have Shazam run from startup, or just activate it when you need it. Shazam.com has also been given a facelift for the launch of the new app. You can hop straight from Shazam's app to the website where you'll find lyrics for the song and more information about the artist discography. 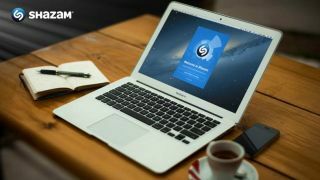 The bad news for PC owners is this is going to be only for Mac for the time being, however Shazam Chief Product Officer Daniel Danker told TechRadar that PC could get it in the future. "We have a brilliant partnership with Apple so we started there. We'll see how it goes. If this is a phenomenal success, we'll be looking at other platforms as well." Mac users can go download the Shazam app from the Mac App Store right now. And once it's found a match, Shazam will offer a quick way to see lyrics for the music you're hearing. Unfortunately you can't use Shazam for Mac to boot up a song in Spotify, but Danker promised us that "absolutely streaming services are going to make their way into this at some point." While Shazam's always-listening function is just an option, there will no doubt be more than a few who are concerned about privacy. But Danker told us that Shazam has no way of candidly recording conversations when it's listening out for music. "We're incredibly clear about privacy," he said. "We actually don't record audio. We instantly convert the audio coming in into an audio fingerprint, and that fingerprint essentially just identifies the distinctive points about that music. "It then compares those distinctive points with the tens of millions of tracks that are in our database. So there's no audio moving back and forth. In fact you can't even use the fingerprint to reconstruct the audio." Thanks to a partnership with Shazam, users of Apple's upcoming iOS 8 will be able to scan songs with a single press of the home button. After Shazam for Mac, Danker believes this is the next obvious phase of making Shazam more easily and quickly accessible. After all, time is of the essence when you're trying to recognise a catchy tune from a fleeting advert. "The Siri integration is a good third step on the path to more seamlessly integrating it into people's lives."